Take your travel cues from the woman who knows travel best. Samantha Brown outfits you in chic style so you can get to your destination organized and looking your best. Why worry about where to store personal belongings when you have a neat lightweight underseater that does the trick. Contact your airline for specific luggage weight and size requirements, as each airline's regulations may vary. Max Capacity: Approx. 35 lbs. A great underseater, and also perfect for an overnight or weekend getaway. I got it in Koi orange to match my 28 spinner. Pockets and main packing area are perfect for my needs. I bought the 28 and the extended underseater in brown in 2018 and this year ordered a second set. This lightweight suitcase is exactly what I needed. The color, Koi orange is unique and fun. I also have it in the brown . Easy to pull, push and maneuver. Love this item I hope the 25" in the blue comes back in stock. 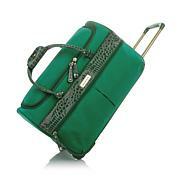 I also have the Aqua color in the leather type luggage. Both are just beautiful. But this light weight is a blessing. I Travel to Florida every year and this holds so many items and keep me organized. I take the 21" on board with me. Holds my computer and a C-Pap machine along with other items. Very Happy ! 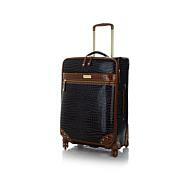 This light weight luggage is perfect for any traveler. A must buy! Samantha Brown knows travel. As host of one of television’s most well-known travel shows, she takes you with her as she gallivants around the world. 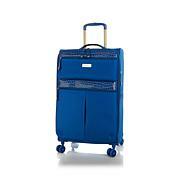 Sam relied on years of expertise when creating her own brand of luggage. 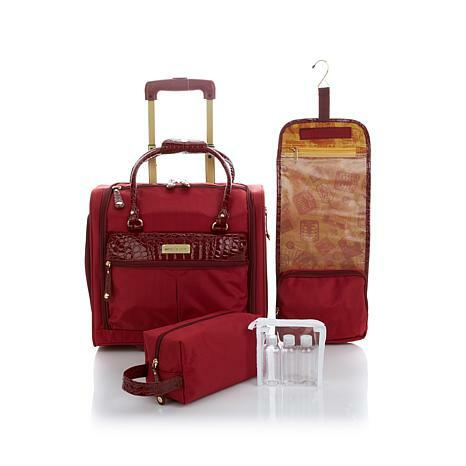 Based on the only bag she takes with her, the travel expert’s pieces offer loads of organization and tons of practical features. Enjoy where life takes you! Remind me about Samantha Brown upcoming shows.